We’re coming to Madison, WI this spring to play at the Crucible. We’re really looking forward to bringing our music out there; hope to see you there! AL1CE is a multimedia performing arts rock group that fuses dance, surrealist art, video, world music, electronica and rock into a veritable broth of sound and vision. The music began as a collaboration between Gordon Bash, Tash Cox, and Scott Landes, all members of Mankind is Obsolete, who began forging their vision of creating a surreal sound and bringing in their influences of Pink Floyd, Tool, Queen, and new wave and electronic music into a fusion that grew organically during early jam sessions between the three original members. The concept of AL1CE was conceived by the trio on an excursion to Joshua Tree, a desert park dotted by silhouettes of cacti, a rugged terrain, and the foundation from which their imaginations were able to spark and ignite. Their ultimate vision included theatrical elements, and AL1CE began to branch out to collaborate with Sypher Arts Studios, an artist collective that put on the Labyrinth Masquerade Ball, the largest masquerade ball in North America. This collaboration would set the foundation for AL1CE to become the musical part of an immersive show. After releasing their debut album, the trio would eventually grow into a 5-piece, with Sasha Travis and Steve Kefalas completing the lineup. Coming from a background of filmmaking and theater, Sasha became the main director for all the music videos that would be launched every full moon for 14 months. 2017 and 2018 became the most ambitious years for the group, as they released one new song, music video, and accompanying artwork every month during this time period, with the final culmination of that work, “The Thirteenth Hour”. During this time, AL1CE toured extensively and would film, edit, and create music, even while on tour. The music from this album reflects the lives of the band members through this passage of time, exploring themes of loss, longing, mortality, and ultimately empowerment, with the music expressing the strong bond within the band. Honoring their collaborative spirit, the group worked with over 100 artists to make both music album and movie. The highly talented cast and crew included artists who had worked on shows such as American Horror Story, Westworld, and Sleepy Hollow, bringing in a wide background of genres that brought in elements of surrealism, horror, and sci-fi into the film. The full feature length film Anthology DVD seamlessly ties together each song into the underlying storyline. After a successful PledgeMusic campaign, AL1CE launched a Pacific Northwest tour in late summer 2018. The group has traveled the world as part of The Alice Project collective, taking part in music exchange programs in Algeria and Uzbekistan through the US State Department as cultural envoys. They have also performed as one of the main musical acts for Anime Expo since 2015, which has an attendance of over 100,000 anime fans every year. 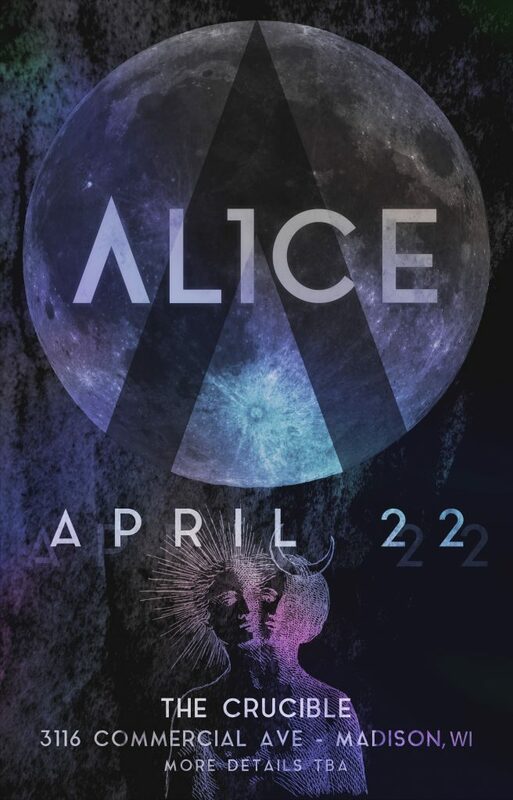 AL1CE is actively touring to support “The Thirteenth Hour” across the United States and is planning a full national US tour for the Spring of 2019, as well as recording and producing a full length cover album.